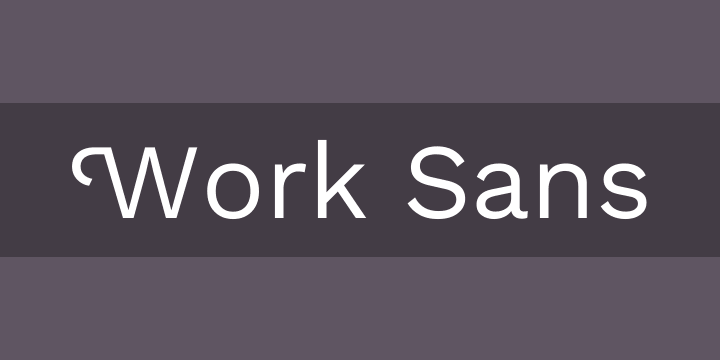 “Work Sans” is a typeface based loosely on early Grotesques — i.e. Stephenson Blake, Miller & Richard and Bauerschen Giesserei. There are 10 weights (the 10th Hairline weight is considered a bonus since CSS only allows for 9 weight families). The core of the fonts are optimised for on-screen medium-sized text usage (14px-48px) – but still can be used in print well. The fonts extreme weights are designed more for display use. Overall, features are simplified and optimised for screen resolutions – for example, diacritic marks are larger than how they would be in print. Work Sans covers Adobe Latin 3 and supports Afrikaans, Basque, Breton, Catalan, Croatian(Latin), Czech, Danish, Dutch, English, Estonian, Faroese, Finnish, French, Gaelic, Gagauz(Latin), German, Hungarian, Icelandic, Indonesian, Irish, Italian, Javanese(Latin), Latvian, Lithuanian, Malay(Latin), Moldovan(Latin), Kashubian, Norwegian, Polish, Portuguese, Romanian(Latin), Sami(Southern, Northern, Inari, and Lule), Serbian(Latin), Silesian, Slovak, Slovenian, Sorbian, Spanish, Swahili, Swedish, Turkish and Walloon.